On mornings where I don’t have a substituting job or volunteer work to go do, I come back home and turn on the Soundscapes channel on Music Choice, make a pot of hot water, and start making tea. I have a little teapot that I make chai tea in, filling it half full of hothot water with honey and half with milk and then the loose chai I got in Gatlinburg last year. While that’s steeping, I use the bottom half of the pot (which is a giant cup) to make quicker-steeping tea. Then on colder days I go sit in my corner chair with the owl-pillow-of-love and stare out at the trees and birds. This time of year there are tons of black birds and robins out in the yard fighting for worms. I love hearing them fly off in an enormous whoosh when something scares them. On warmer days I take my tea outside onto the back patio and sit on my rocker-bench and feel the breeze in my hair. I think about things I’d like to do in my yard later in the year when the kids are home for the summer and better ways to store all our outdoor stuff (I’d love it if my brain would turn off organizing things during my restful times, but it never does.). Inevitably the phone rings and it’s back to regular life, but during these quiet moments all is right with the world and everything seems hopeful and lovely. I also spent two days subbing, once in kindergarten and once in first grade. Both are fun, but first grade is less exhausting. February 21, 2013 Lisa H.
This doesn’t look as tidy as I’d like, but for a $3 over-the-door tie-and-belt rack, it does the job. No more lost belts & ties! Woo hoo! Shoes are always going missing in this house, but NO MORE. Bottom two rows are Greg’s, next two are Ben’s, and next two are next-size-up for each of them (for those days when Daddy is impatient). Honestly, I’ve gotten nothing else done since then, except a tiny bit in my makeup & hair boxes. Steph and I did a writer’s retreat this weekend, which I posted about here(from a writing standpoint) and here (from an RA standpoint). Since I’m still working on last month’s holidays, I brought her her family’s gifts, and she sent some home with me for the boys as well. 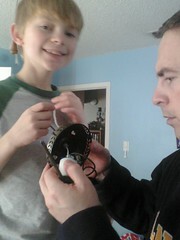 Greg pulled out his science kit and we spent quite a while trying out all its tricks. I remember playing on this with them when they were all babies! This sign on the door of the bathroom at the park cracked me up! Yesterday I didn’t have to work, but I did have a bunch of errands to run: a Goodwill drop-off where I spoke to a man named Ram about how God changed his life, a grocery store run to buy lunch makings since the kids had eaten them all up over the weekend, and then my book study on Raising Resilient Kids over at the PDC. 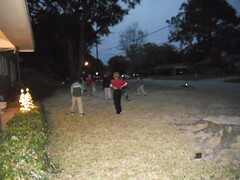 After school Ben had dance, so Greg and I hit the dollar store so he could use some of his Christmas money. Then off to piano lessons, where we got a lesson on what goes on inside the piano and how all the pedals work. It was awesome! Our teacher is super interesting! 🙂 We love her! I was thinking the other day about resolutions and what mine should be this year. I think mine from last year are still on the fridge, actually, but rather than look at the past, let’s look to the future, shall we? This year I plan on losing 50 pounds. Yes, fifty. 2011 was the year that I gained 25 pounds and I started out the year needing to have lost at least 25. So that puts me at 50 pounds this year to lose. My plans include a) having acquired a bunch of lovely to look at, but not in my size-range-yet clothes to spur me on, b) having rejoined Sparkpeople.com to chart my diet and exercise, c) having enlisted my husband into the process to help me keep on task and d) having filled up my netflix DVD queue with exercise titles solicited from friends that exercise-but-aren’t-exercise-fiends. This year I also plan on returning to daily journaling. I haven’t kept up on daily writing in a few years, so I thought that rather than make a word goal or a page goal, I’d make just writing a goal. I’m going easy on my self this year and including any words I write go towards that, be they in a paper journal, here, on my RA blog, in poetry form, or fiction. Just getting back in the writing habit. I’m continuing on with my piano lessons this year, but that isn’t really a goal, is it? So here’s a little goal: I plan on playing something for church every third month this year. How’s that? Last but not least, my husband and I have gotten ourselves a daily devotional to work on through the year. This one is a Bible-in-a-year Couples devotional. We’ve never tried doing something like this (reading a book let alone a devotional) together before, so that should be interesting. There you have it: my plans for the year in a nutshell. Hope y’all are having a great new year! Someday I’ll be back again with tales of our last week of Winter Break. …but trying to catch up. In case you were wondering, I’ve gone back and finished up a few posts and hit “Publish” today, so in case you’re reading from a feed-reader you might want to visit the site and see what’s gone up lately (I’ve noticed that sometimes Google Reader doesn’t update when I hit “publish” on back-dated posts. Or sometimes it just pops up all 8 billion all at once. YMMV.). I’ve been saving posts on the theory that someday I might upload the photos and add the photos to them. Hahahah. Today was that day. But let’s not let me get ahead of myself. 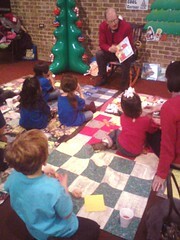 Last Friday we got up and did…something, who knows what, until it was time to go to playgroup. 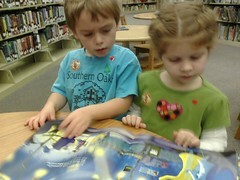 This week they texted me that they wanted to do the library, which was fine by me, as we’d had to skip on Wednesday. 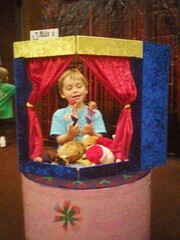 The library’s Circus Day was different than we’d expected, more like an indoor winter carnival than a circus. It was fun for the kids, though. There was hand stamping and face painting (strangely none of our children wanting either thing done). 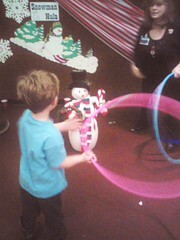 Punching dolls and snowmen were set up to throw hula hoops around. There was a Bobbing for Bears booth and Snacks & Storytime as well. After the library we came home and I was exhausted. It was lunchtime. Nick looked at me and suggested a nap. So I reminded him of the kids rescheduled piano lessons, put my ear plugs in, and went to bed. I slept until 4:30 when the piano teacher rang and asked if we were still planning on coming. Apparently no one else remembered piano lessons. So I got up, drove the kids over, and stared out the window until it was time to go home. I got to officially meet her daughter and chat about pinterest for a few minutes, which was nice, but I was so out-of-it. Took the kids back home and tried to get things done, but really was not awake enough for anything. Saturday we got up and blissfully had nowhere we needed to be. I rested all morning, as I was still exhausted, but things did not improve for me. Everyone else went to church and I stayed home and slept. By the time everyone got home I was doing well enough to load & unload the dishwasher, but not much else. Then I found Nick the dishwasher guide and he tried to fix the dishwasher. He got as far as I did the day I tried and also couldn’t get the part off that I couldn’t get off. So we read the guide and decided to try the suggestion to run hot water in the sink before we run the dishwasher. It’s seemed to help somewhat. We washed and cleaned and swept and cleaned some more until dinnertime. It wasn’t a really exciting day, actually. Just productive. 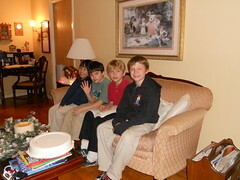 Yesterday I got the big kids to draw me their plans for their Scout Cake Auction cakes. They’re supposed to design and make their own cakes with a scout-like theme. We looked online for some ideas to enhance our designs, made a list of supplies needed, and then it was time for the big kids to be dropped off at school. Greg and I went shopping for those supplies, plus a few others for other baking related things we have going on this week (piano recital, gift cookies, cookie exchange cookies). We did not get the film that was developed because the film area was not open until 9am, which I find ridiculous, especially this time of year. Grr. Got home in time to pick up Greg’s school stuff. Once I got him settled at school, I came home and baked my first batch of cookies for the week, courtesy of Pinterest (recipe here and using stamps to press cookies here). Nick called and said he was leaving for Houston before lunch so he never got to sample them. At that point it was time to head out for the PTA meeting. 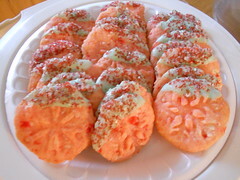 I brought them some cookies and some for the office staff as well. We had our meeting and then put together staff appreciation gifts (scented candles and hand-signed cards with candy canes attached with ribbon). I got out in time to grab food from home to eat on my way picking up Greg from MDO. Picked him and the big kids up, got them to practice their piano pieces one last time, then gathered up my kids plus an extra that was coming to be the audience for the mini-recital. Since our local family doesn’t celebrate Christmas and my parents are in BCS during the week, we asked friends from school & their moms (one mom not pictured) to come hear our little recital. It was a really good evening! At home I made a really simple dinner and we watched “How the Grinch Stole Christmas” to wind down before bed. Today we got up and I did a mini recital of my own for my own kids while they got ready for school. 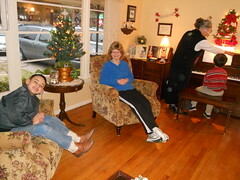 It was nice to play through my Christmas music for them and they enjoyed singing along. 🙂 Got the big kids off to school & then A. came over. 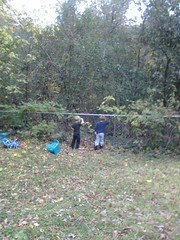 The kids played in the back yard most of the morning, digging for dinosaur bones and looking for T-rexes over the fence in the creek. December 14, 2011 Lisa H.
Catching up on life: We had a great vacation. We went down to Galveston Island (about 5.5 hours from us) and stayed in a condo near the beach. We got up later than we normally do and watched the sunrise on the balcony or on the shore every morning and went back out there again for the sunset. We listened to the seagulls cry. We walked nearly everywhere: restaurants, church, the beach. We had time with friends. We went to Schlitterbahn Water Park (just the indoor part) and Moody Gardens. The weather was perfect. I really did want to stay there forever, which never happens for me on vacation (usually I get more and more stressed and want to go home). It was a delightful trip. Since getting back home I’ve tried to work a little more of that laid back vacation attitude into regular life. I head out onto the front patio with my tea in the morning and sometimes even make it back out onto the back patio in the evenings. Nick and I made a joint decision to watch a little less TV than we had been, so we deleted a few shows off our DVR, just in time for the World Series. So I’ve watched less TV, at least. (Things we dropped: Raising Hope, Fringe, & some of the new stuff we’d recorded but never watched) I’ve spent that time reading or doing crafts, which I love. I have a secret project I’ve been working on for a friend, so I’ll post about that after the gifting has been done. I was hoping to add some more walking into my schedule, but that hasn’t worked this week yet. After this week I’ll have more time, so maybe Greg and I can go take some long walks at the park trails. Another new thing in my life is piano lessons. I took piano from the time I was in 3rd grade until my senior year of high school. I was considering going on to music school in college, but got extremely burnt out on everything and quit taking lessons and went on to be an English major instead. But I’ve kept up with music; I sang in choirs at church, taught beginning piano and clarinet lessons for a bit while in college, played my clarinet in various community groups throughout the years, and have been doing piano duets with my mother-in-law at church lately. I can still play well from sheet music, but I wanted to learn to improvise and accompany. My kids piano teacher had mentioned that the system she uses with beginners (the kids will be starting it soon) had a corollary program for “professionals” and she also had a time slot open. I figured out a way to fit it into the budget (no more lunches out and no more fancy beverages pretty much did it; the added bonus is that theoretically that will help with weight loss, right?) and off I ran with it. 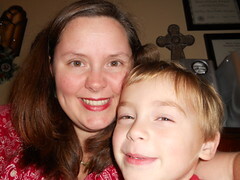 I started last week in David’s time slot while he was away at camp with a school program. I’ve already managed to memorize 3 chords and their minors & 7ths, which had totally eluded me in the past (perhaps because while my teachers always told me what kinds of chords things were during lessons, the chords themselves weren’t what I was practicing, not in my mind). I have my second lesson today. I’m very excited. 🙂 Unfortunately all the practicing is making my hands more twingy and achy, but I’m trying to figure out the best way to deal with that and I think I’ll go back to doing my hand stretches in the morning again. November 3, 2011 Lisa H.
I got up this morning, wandered through the house, and thought to myself “How is it that it all gets THIS messy in just one day of me not tidying?” Nick said that I do more than I think I do or than maybe he thinks I do around the house. No, the house is never totally clean, but is anyones? I mean, other than those live-alone (or just couples) neat freaks? I really don’t think so. We spent the morning yesterday playing outside before heading over to the DSP for a play date with Greg’s friend B. DSP has changed themselves up with a lobby over in the front corner near the street while their real lobby is under construction. They have opened up this room in the middle that I always though was a classroom so that we can all easily move between the rooms and I was so interested in that room. At one end is a stage, a real stage with doors going out the sides for entries and such. It had a nifty ceiling and places for projectors and lights. They’d moved some of their displays in there, things that used to be in the hallway and out here, where you can see them, the kids were delighted with them. In the hallway, where they were, you kind of just rushed past them on your way somewhere else. There wasn’t enough light or room to back up and look at them (plus if you were trying to look at them, you were in the way of other people rushing through the hallway). So anyway, we had a play date. Greg & his friend B. played for a little while before B. had his screaming fit. He screamed through three play areas before B’s mom dragged him out to the car for a time out. I don’t think I’d have lasted that long with a kid screaming and pulling on me. Greg put on a play for me in the theatre area (not the place with the stage, but the little house in the other room) about a mechanic with a dinosaur hat that didn’t fit. It was pretty funny, especially since he was wearing a painter’s smock with cowgirls riding horses on it. B’s mom and B. finally came back in once he’d calmed down. By then Greg and I were in the play car, driving to the “saladbee” place. We still don’t know what that word was supposed to be. Greg’s response: “The place! Where they have the saladbees!” No idea. We played in the ambulance for a while after that and then let the kids roam on their own in the big play area together while we talked about Bible studies and different views on various verses. After that we had some lunch; or rather, the boys had some lunch while B’s mom tried to get B. not to wipe his hands on his clothes and I tried to get Greg to eat some carrots (we both failed in our attempts, sadly). Then the kids played in the toddler area, jumping in and out of that little room until it was time to go. Greg and I came home and I attempted to eat lunch, but the tomato soup we had was fancy and weird flavored, so Nick ate it. We watched most of an episode of Hawaii 50 before he had to go back to work. By then I was feeling pretty puny, so I sent Greg off to watch a video while I laid down on the couch to rest. Eventually I took my temperature because I was freezing cold and the thermostat told me that the house was hot and it turned out that I had a fever. I think it must have just been the arthritis related fever because I am feeling lots less achy and no fever this morning. I bundled up in a blanket while Greg played outside before we went to get the big kids. We picked them up, brought them home, and started them practicing their piano music and theory before moving on to David’s piano lesson. Well, it was supposed to be David’s lesson, but the piano teacher had a mostly verbal lesson to give both kids, so she did a bit of David’s lesson, then called both kids over to tell them the story of how the piano came to be. David will have a bit of a lesson this afternoon, as will Ben. I liked how the piano teacher incorporated the Bible into her lesson, telling the kids that in Genesis 4:20, they tell of Jubal and his brother Jabal and how one of them was a master of string and organ. That really got the kids interested. 🙂 I need to find them a map of Italy today so that they can see where the language of music comes from. I’m sure there must be one somewhere on the internet that shows where all the major composers came from. *ok, so this isn’t really 750 words. It’s not always. A lot of times it’s more than that, but I am trying for 750 words of something every day, just to keep up the habit of writing, if not always the fiction writing. Some mornings, like this morning, my brain is a little too scrambled for fiction. Those mornings are lucky for the blog because then I’ll ramble about daily life instead. Woo hoo for scrambled brains! * No, we don’t listen to many mp3’s at home. We have lots, but iTunes hates me. We listen to CD’s on a 3-disk changer that’s gone horribly awry. It sometimes picks songs at random off of any of the three cd’s. You never know what you’re getting. It’s awesome, actually, if you don’t mind having musical chaos.